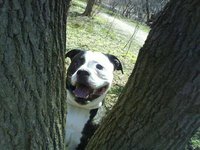 Toronto Dogs Directory: A Wonderful Reader Story About One Woman's Awesome Mission To Help Her Sweet Doggy! A Wonderful Reader Story About One Woman's Awesome Mission To Help Her Sweet Doggy! Bubba is a 4year old bulldog who needs cruciate ligament surgery. Bubba's owner is a university student putting herself through school. Trying to make it on her own. Bubba is her family. The surgery costs $4,000. We're trying to help Bubba get the surgery he needs so he can have a good life with his family. We're raffling 7 cakes and a basket of baked goods made by some of the best bakers in the Twitterverse to raise money for Bubba. You can make a donation just off to the right. Every donation of $5 or more puts your name in the raffle. A little while ago, Bubba's owner put an ad in craigslist asking for help. She wrote that she knew it sounded like a scam, but she was willing to provide the name of the vet so people could follow up if they weren't sure. And all she wanted was for Bubba to have his surgery and not have to be put down. So Mari (@marimoreshead on Twitter) sends me the ad about Bubba and asks "what do you think?". And follows up with an email to Bubba's owner. Mari confirms everything with the vet. Finds out that $1,300 has been raised so far. Bubba is seeing the vet on the 25th of October and then a surgery date will be set. Bubba's owner is doing whatever she can. She's been fundraising, asking friends, family, strangers for help. And so Mari and I thought... if Bubba's owner is willing to put it out there to ask for help, why not use that awesome Twitter magic to help Bubba? As simple as it seems, I think Mari found this ad and showed it to me so that we could help Bubba. Thats the feeling I get. And the only way I know how to do this is to ask all those awesome people I know to help us reach the goal of $4,000 to pay for Bubba's surgery. Mari has collected some delicious cakes from some equally delicious bakers and we're offering them up for raffle! Make a donation and you'll have a chance to win a cake! Unfortunately, we can't deliver outside of Toronto, but if you're not in Toronto and you win, you can donate your cake to someone who does live in the city. And if you can't give anything, then if you can help spread the word and send some good thoughts Bubba's way, that would be equally incredible. We've got a facebook page to keep you updated on Bubba and his progress.